American Muslim Day Parade-NYC-2013 (Pics & Vids) | the "silent" majority no more! 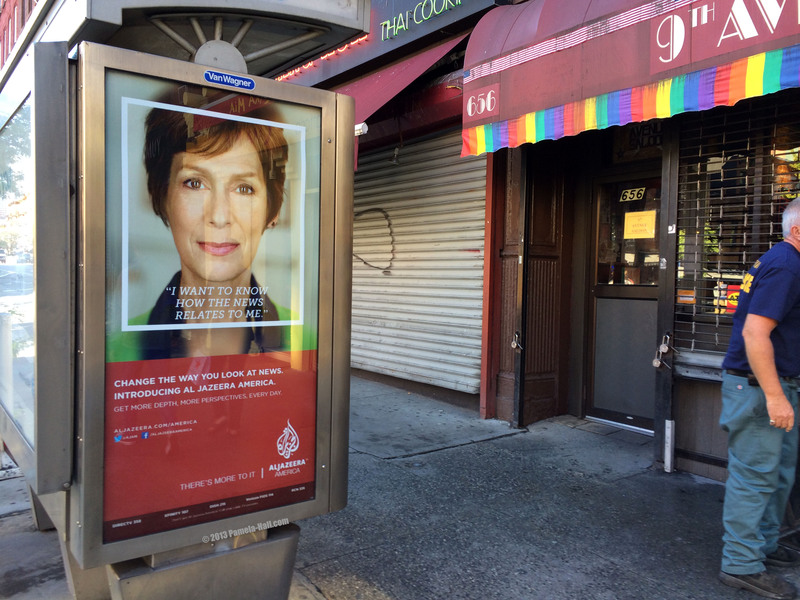 While walking to the Annual American Muslim Day Parade, I spotted another phone kiosk poster for al-Jazeera TV…outside a GAY bar…. and most passersby, no doubt, remain ignorant and unaware of the real purpose behind these ads. “Islam’s black flag with the shahada and sword inscription has been used over the centuries to intimidate their adversaries and create despair. It is generally used after a cleric has issued a death FATWA . Preparing to march in solidarity with the other militants were “Fakestinian” kuffiyas, also carrying the black flag of al-qaeda, and…. the flag of Puerto Rico. Islam, Sharia…they are not allowed to support anything but ISLAM and the UMMA. Especially when other parade participants were members of Charles Barron’s, “Freedom” Party. City Council member Barron is an infamous Marxist-loving ‘former’ Black Panther and these were rather intense parade participants. Which begs the question, “WHERE WAS Charles Barron?” And others ….like… Rabbi Feinberg. Debbie Almontaser. Lamis Deek. Linda Sarsour. Nihad Awad of CAIR. Cyrus McGoldrick, once a youth leader of NY-CAIR. NO NYC Council member, Robert Jackson, a ‘revert’ to Islam. Jackson once proclaimed Harlem to be the Mecca of NYC. WHERE are the hard-core Marxist agitators who help co-ordinate so many Muslim protests? No Andy Pollack. Sarah Flounders of IAC. Caleb Maupin. Bill Doares. Donna Nevel and all those “Not in My Name Jews” and the “oh-so-cute” protesting “Grannies”. Saw NONE of them. So many familiar faces missing. Ignoring the happy families and many children momentarily, and taking a good hard look at the militants in the parade, since there are no banners or signs enumerating Islam’s contribution, perhaps….the Militants… ARE Islam’s contribution to HUMAN Civilization! As they walked down Madison Avenue chanting takbirs, allahuh akbars and “WE ARE MUSLIMS, MIGHTY, MIGHTY MUSLIMS“, is this REALLY just a “friendly” Parade or are there deeper intentions that America, at our own peril, has chosen to ignore? The words on these flags are supposed to be the shahada, the muslim declaration of ‘faith’ in ‘allah’. One very odd fellow (not in costume) was dancing, even though he wasn’t meant to do so. VIDEO PART 3 – PRAYERS . The prayers were led by a ‘moderate’, supposedly pro-American Muslim, Abdel Hafid Djamil, a Board member of the terrorist supporting Muslim American Society. Abdel Hafid Djamil of MAS is a man who railed against Kelley and the NYPD Police Department in 2012 with claims of ‘racism’. Djamil also led the fight on Staten Island to build a mosque on Catholic Church property. One of their chants was,”Stop the Killing, Stop the Genocide” but I didn’t see any Coptic Christians or Jews in the crowd, so whose genocide were they referring to? Continuing to look for the parade’s elusive theme. Perhaps THEY thought this one to be so obvious, right under our “collective noses”. Perhaps, the NIQAB IS ANOTHER of ISLAM’S CONTRIBUTIONS to HUMAN CIVILIZATION! The niqab (or ‘veil’) and burkha, and to a lesser extent the hijab, are utterly symbolic items of dress. Despite what people think, even in the Arab world — as well as in Iran — the burkha and niqab didn’t start being widely (if at all) worn until the late 1970s. In the UK itself, it is a very recent phenomenon. The burkha and niqab only began to be worn in the late 1990s or even in the 2000s (in many cases later than that). The niqab is a symbol of Islamism/fundamentalist Islam and of self-conscious difference. It is a symbol of the Muslim woman’s complete separation from non-Muslim society. It is a political and religious statement. Think we could have a parade in NYC (or anywhere) shouting, “We are ALL Christians, Mighty. Mighty Christians” as we marched down an avenue. Shouting prayers and declarations like, “Jesus Christ is King” “Our Savior”… or whatever…. and make a grand showing of how many of us work in different government positions. Not very likely. The Muslim Community needn’t ‘worry’. We’d be denied or discouraged by the authorities from mimicking their parade. Period. Reaching out at the Blood Drive table…. Perhaps the devastating Islamic JIHADIST attacks happening globally were played up to ‘someone’ claiming the MUSLIM community would be in DANGER… from… the Jihadis supporters who just happened to be marching down Madison Avenue. Really? Did our police really believe there was an increased ‘threat’? Those chanting “We are Muslims, mighty, mighty Muslims were doing so to the Union chant so familiar to all of us. I saw this ‘parade’ too and was stunned to see that their numbers were so much greater than prior years. Are we importing Muslims into America? – I guess so. Between the left and the Muslims – feels like we’re at Custer’s last stand. Hi, B. The parade seems larger this year, though not as large as it has been about 5 years ago. And I agree, I think there is a definite ‘importation’ going on…. Before anyone ever heard of Islam, Jews, Christians and other non-Muslims believed and still believe strongly in the Glorious, Awesome Creator, the One God. The God of all life who is the complete OPPOSITE of the Muslim god who continually calls for the MURDER of non-Muslims. Muslims walked with great confidence in NYC holding the white and black flags of jihad – openly proclaiming their goal of violent jihad against us. City officials and police gave their FULL APPROVAL of Muslims holding the flags of jihad by their attendance and by their REFUSING to denounce the wicked Muslim goal of jihad against our people. Our people are horribly betrayed by our leaders. maybe some anti- islam parades of our own are in order, they don’r scare me even a little! I say, let us l go to their country and have a Christian Day Parade in Honor of Christ Our Lord. Further more. They stop us from praying in public, can’t mention Jesus…why stand back and allow this? Where is Christian America??? WHERE???? We are NOT a Muslim Nation , We are a Christian Nation, One nation under God. Christ is Lord and He reigns….Has America become ashamed of Christ? America stand up now, before it is WAY too late. Remember always : the Lord said, if you are ashamed of Me I too will be ashamed of you. The recipe for “A Happy Home, a Happy Marriage” left out the all important ingredient of wife beatings (Quran verse 4:34).